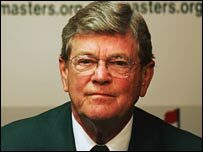 Hootie Johnson is stepping down as chairman of Augusta National Golf Club, home of the Masters. Johnson, who has been a controversial figure since taking over the role in 1998, will be replaced by Billy Payne, who ran the 1996 Atlanta Olympics. Johnson oversaw two major overhauls of the course, adding hundreds of yards in length and toughening holes as players hit the ball ever-increasing distances. He also led the fight against demands that women be allowed to join the club. Johnson, 75, was in the headlines as recently as last month following alterations made to Augusta before the 2006 Masters, won by America's Phil Mickelson. In the run-up to the event world number one Tiger Woods, who usually avoids controversy, said the charges would shorten the list of potential winners. And Jack Nicklaus, a six-time Masters champion, accused the club of "ruining" Augusta National. In reply, Johnson said simply: "We are comfortable with what we are doing with the golf course." He also featured heavily when a campaign was launched calling for women to be admitted to the exclusive members' club. The demands were led by National Council of Women's Organizations (NCWO) chief Martha Burk. Johnson's reply, in 2003, was couched in similar terms to those he used about the course changes. "There may well become a time when we may include women as members of our club," said Johnson. "I want to emphasise that we have no timetable and our membership is comfortable with our present status." Johnson, a member of the club since 1968, will relinquish his title on 21 May and move into the role of chairman emeritus. "I have enjoyed my time serving as chairman," he said. "Working with club members, staff and volunteers on the Masters has been very rewarding. "The tournament is successful by any measure and will continue to grow. I know I leave the championship in very capable hands." The 58-year-old Payne has headed the Masters media committee since 2000. He said: "Hootie did a wonderful job as chairman, and I will endeavor to maintain the customs and traditions of our club as established by Clifford Roberts and Bobby Jones."